Wright Taylor Pridgen, son of Benjamin Franklin Pridgen and Alice Wright Pridgen was born on his father’s farm 5 miles west of Grapeland on January 27, 1872 in a house built of sawed and fitted logs which still stands today. He attended school in Grapeland and Waco and became a successful farmer and rancher. W. T. Pridgen was postmaster of Grapeland from 1924 to 1933, and was a director of the Grapeland State Bank for 35 years. he died in 1962 at the age of, 90. He married Gertrude Pridgen, a school teacher from Eagle Pass in 1908. Gertrude Pridgen was the daughter of George and Mollie Pridgen and granddaughter of Boliver Jackson Pridgen. She was born in Cuero, Texas in 1882 and attended school there. Later, she taught school and did stenographic work. She was a good neighbor and a true wife and mother. 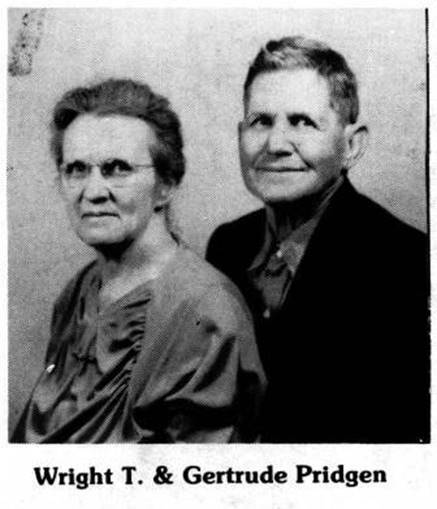 Gertrude Pridgen died in 1964 and is buried in the Grapeland Cemetery beside her husband. Wright and Gertrude Pridgen lived within the townsite of Grapeland in a lovely two-story home. It was on the corner of Block 13, lot 1 and was the only house in town that faced North and South, The children of this union are as follows: 1. Girl-died in infancy. 2. Jack Stafford Pridgen married Francis Enloe Darsey and had one son, Brent Pridgen. 3. Harry Crockett Pridgen married Nell Jones and had 2 sons-Gerald Wright and Harry Wayne Pridgen. Harry C. Pridgen later married Marguerite (Miller) Henderson.